Gifu Prefecture (岐阜県, Gifu-ken) is a prefecture in the Chūbu region of central Japan. Its capital is the city of Gifu. The land area that makes up modern-day Gifu became part of the Yamato Court around the middle of the fourth century. Because it is in the middle of the island of Honshū, it has been the site of many decisive battles throughout Japan's history, the oldest major one being the Jinshin War in 672, which led to the establishment of Emperor Temmu as the 40th emperor of Japan. The area of Gifu Prefecture consists of the old provinces of Hida and Mino, as well as smaller parts of Echizen and Shinano. The name of the prefecture derives from its capital city, Gifu, which was named by Oda Nobunaga during his campaign to unify all of Japan in 1567. The first character used comes from Qishan (岐山), a legendary mountain from which most of China was unified, whereas the second character comes from Qufu (曲阜), the birthplace of Confucius. Nobunaga chose those characters because he wanted to unify all of Japan and he wanted to be viewed as a great mind. Historically, the prefecture served as the center of swordmaking in all of Japan, with Seki being known for making the best swords in Japan. More recently, its strengths have been in fashion (primarily in the city of Gifu) and aerospace engineering (Kakamigahara). On October 28, 1891, the present-day city of Motosu was the epicenter for the Mino-Owari earthquake, the second largest earthquake to ever hit Japan. The earthquake, estimated at 8.0 earthquake, left a huge cleft in the ground that can still be seen today. One of the few landlocked prefectures in Japan, Gifu shares borders with seven other prefectures: Aichi, Fukui, Ishikawa, Mie, Nagano, Shiga and Toyama. Japan's postal codes all start with a three-digit number, ranging from 001 to 999. 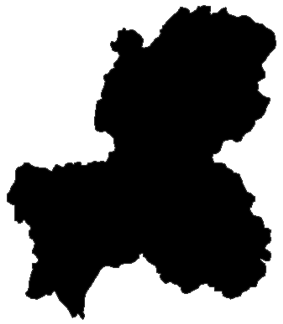 Part of Gifu has the 500 prefix, reflecting its location in the center of Japan. The center of Japanese population is currently located in Seki City, Gifu Prefecture. The center of population is a hypothetical point at which a country is perfectly balanced assuming each person has a uniform weight. The spot was calculated using the 2005 census. 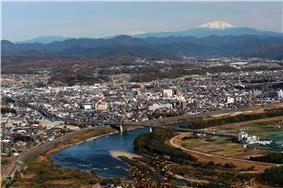 Gifu has five unofficial regions, which allows local municipalities to work together to promote the surrounding area. 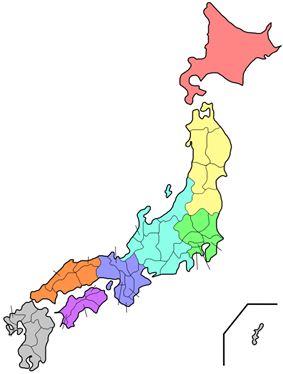 The five regions are Seinō, Gifu, Chūnō, Tōnō and Hida. The borders of the regions are loosely defined, but they are usually delineated among major cities. 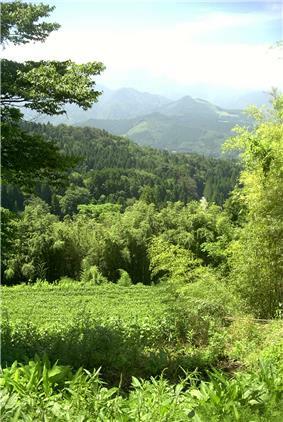 The northern Hida region is dominated by tall mountains, including parts of the Japanese Alps. The southern Mino region is mostly parts of the fertile Nōbi Plain, a vast plains area with arable soil. Most of the prefecture's population lives in the southern part of the prefecture, near the designated city of Nagoya. The mountainous Hida region contains both the Hida Mountains,which are referred to as the "Northern Alps," and the Kiso Mountains, which are known as the "Central Alps" in Japan. The Ryōhaku Mountains are also in the Hida region. Other major ranges include the Ibuki Mountains and the Yōrō Mountains. Much of the Mino region is made up of the alluvial plain of the Kiso Three Rivers, which are the Ibi River, Kiso River and Nagara River. The sources of all three rivers are in Nagano Prefecture and they eventually run through Aichi and Mie prefectures before emptying into Ise Bay. Other major rivers in the prefecture include the Jinzū, Takahara, Shō, Shōnai, Yahagi and Itoshiro rivers. Gifu's climate varies from humid subtropical climate in the south, eventually making the transition to humid continental climate in the north. Because the Mino region is surrounded by low mountains, the temperature fluctuates through the year, from hot summers to cold winters. The eastern city of Tajimi, for example, often records the hottest temperature in Japan each year and is considered to be the hottest city within Honshū boasting an average daytime high of 34.1 °C during the peak of summer. On August 16, 2007, Tajimi set the record for the hottest day recorded in Japan's history—40.9 degrees Celsius. Summers are hotter, as the landlocked area becomes a heat island, and the temperature rises even further when hot, dry foehn winds blow over the Ibuki Mountains from the Kansai region. The Hida region, with its higher elevation and northerly latitude, is significantly cooler than the Mino region, although there are sometimes extremely hot days there too. The Hida region is more famous for its harsh winters, bringing extremely heavy snowfall, especially in the northwestern areas. Gifu boasts a high amount of skiing locations. Shōkawa-chō, part of the city of Takayama, is up in the mountains, and its location has led it to be called the coldest inhabited place on Honshū. All of the cities, towns, villages and districts of Gifu Prefecture are listed below. Traditional industries such as paper-making and agriculture are found in Gifu, but its economy is dominated by manufacturing including aerospace and automotive, with industrial complexes extending from the Nagoya area. A wealth of small component manufacturing is also found, such as precision machine, dye and mold making, and plastic forming. The Mino region has long been known for its high-quality paper called Mino washi, which is stronger and thinner than most other papers in Japan, and was used by the Japanese military during World War II. Other paper-based products include Gifu Lanterns and Gifu Umbrellas, made in the prefectural capital of Gifu. Other traditional goods include mino-yaki pottery in Tajimi, Toki, and Mizunami, cutlery in Seki, and lacquerware in Takayama. Because Gifu has vast, arable plains, agriculture is also a major industry. 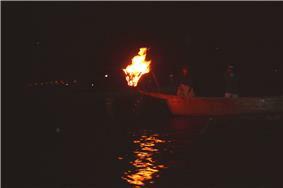 The forests in the north provide materials for woodworking and for the viewing boats used in cormorant fishing. Sake is often brewed with clear water from the rivers. Kakamigahara has a large role in the prefecture's modern industries. It boasts large aerospace facilities of both Kawasaki Heavy Industries and Mitsubishi Heavy Industries, as well as many metalworking and manufacturing companies. Information technology (IT) is gaining a foothold in the prefecture with both Softopia Japan in Ōgaki and VR Techno Japan (part of Techno Plaza) in Kakamigahara. The capital city of Gifu, located between Ōgaki and Kakamigahara, is also working to strengthen its IT fields, too. 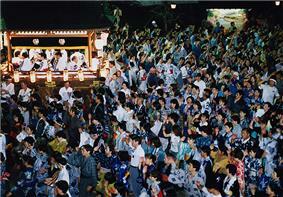 Gifu has many popular tourist attractions, bringing visitors to all parts of the prefecture. The most popular places are Gifu, Gero, Shirakawa and Takayama. Gifu is famous for cormorant fishing, which has a history of over 1,300 years, as for being a long-term residence of both Oda Nobunaga and Saitō Dōsan. Gero is known for its relaxing hot springs, which attract visitors throughout the year. 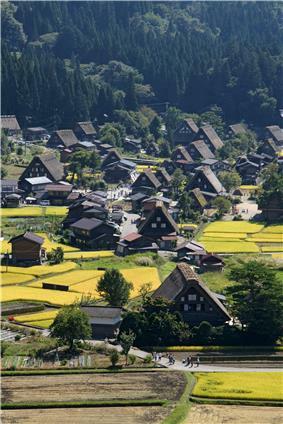 Shirakawa's historic villages are a UNESCO World Heritage Site. Takayama is famous for retaining its original appearance and is often referred to as Little Kyoto. The Kamioka area of the city of Hida is home to the Super-Kamiokande and KamLAND experiments, neutrino and antineutrino observatories, respectively. Located 1,000 m (3,281 ft) underground in Kamioka Mining and Smelting Co.'s Mozumi Mine, the detector searches for neutrinos (and antineutrinos) from the high atmosphere, the sun and supernovae, and for KamLAND, from regional nuclear reactors. The Super-Kamiokande consists of a cylindrical stainless steel tank that is 41.4 m (135.8 ft) tall and 39.3 m (128.9 ft) in diameter holding 50,000 tons of ultra-pure water. Some of the 11,146 photomultiplier tubes are on display at the Miraikan in Tokyo. The same facility also hosts CLIO, a prototype detector for gravitational waves. The prefecture's population was 2,101,969, as of September 1, 2007, with approximately 1.8 million people in the cities and the rest in towns and villages. The percentage of male and female residents is 48.4% and 51.6%, respectively. 14.4% of the population is no more than 14 years old, with 22.1% of the population being at least 65 years old. According to Japan's census, the country's center of population is located in Gifu Prefecture. In 2000, it was located in the former town of Mugi, which has since merged with Seki. In the most recent census in 2005, the center of population has moved slightly more to the east, but is still located within Gifu. The prefecture also has two plants (the milk vetch and the Japanese yew) and two animals (the snow grouse and the ayu) as symbols. The milk vetch was chosen in 1954, because the prefecture is well known for its abundance of blooming milk vetch each spring. The yew was chosen in 1966, because it is the tree used to make ornamental sceptors for the emperor, many of which came from the Hida district. The snow grouse was chosen in 1961, as the birds live up in the Japanese alps and is a nationally-protected species. Ayu were chosen in 1989, because the fish is found in many prefectural rivers and is prized for its sweet taste. ^ Mino Earthquake. (Japanese) Tokyo Science Museum. Accessed July 5, 2007. ^ Nishi Mino Portal Site. (Japanese) Ginet. Accessed June 24, 2008. 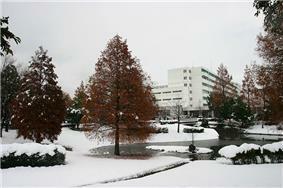 ^ Gifu Regional Promotion Office. (Japanese) Gifu Prefecture. Accessed August 9, 2011. ^ Chūnō Promotion Office. (Japanese) Gifu Prefecture. Accessed August 9, 2011. ^ Tōnō Promotional Office. (Japanese) Gifu Prefecture. Accessed August 9, 2011. ^ Hida Promotional Office. (Japanese) Gifu Prefecture. Accessed August 9, 2011. ^ "平年値（年・月ごとの値）". Japan Meteorological Agency. Retrieved 2011-11-18. ^ "観測史上1～10位の値（年間を通じての値）". Japan Meteorological Agency. Retrieved 2010-03-06. ^ "平年値（年・月ごとの値）". Japan Meteorological Agency. Retrieved 2010-03-06. ^ a b c Statistics Division of Gifu Prefecture. (Japanese) Gifu Prefecture. Accessed November 2, 2007. ^ a b c A Statistical Guide to Gifu Prefecture 2007. Gifu Prefecture. Accessed November 2, 2007.